Eagles offensive coordinator Mike Groh (left) and Doug Pederson have developed a close relationship. Mike Groh is the Eagles' new offensive coordinator, a notable position that helped springboard Frank Reich to become the Indianapolis Colts head coach. But Groh made clear Tuesday that even though he's in charge of the offense by title, it's not his offense. Just like when Reich filled the role, head coach Doug Pederson will call the plays, and the entire coaching staff will have input in the system and the game-planning. "It certainly is not Mike's offense. It's Coach Pederson's offense, it's the Philadelphia Eagles' offense," Groh said in his first public comments since becoming the offensive coordinator earlier this offseason. "We're going to work collaboratively [with the coaching staff] to try to continue to be as multiple and stay out in front of the defenses as we can." The term "multiple" was one Groh emphasized as central to his offensive philosophy. It's easy to say teams have a "West Coast offense" or a "spread offense" or whatever the system du jour might be, but the Eagles try to implement concepts from different schemes. That will be Groh's primary duty. It's not a traditional offensive-coordinator role, because he does not call plays or install his system. But as Reich said in January, the job is explained by the title: "You coordinate." Reich said the coordinator takes all the resources from the coaching staff, piles them together, and narrows them down for Pederson. Groh said he will "help support" Pederson just as Reich did. "If we can do that, we feel like [Pederson] is going to call a great game," Groh said. Pederson and Reich shared a close relationship. They met the night before every game to discuss the game plan. They had a long history as backup quarterbacks who were briefly teammates before the 1995 season. 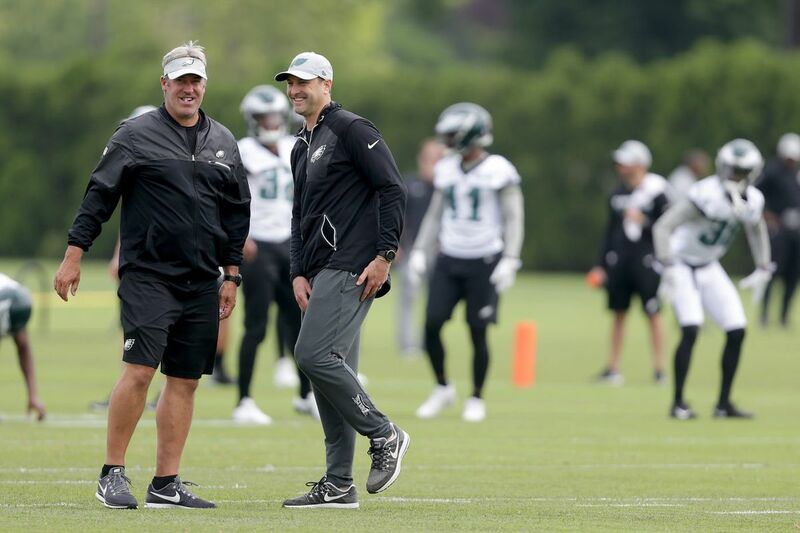 Groh only joined the Eagles' staff last year, as a wide receivers coach, and does not have the same background with Pederson, but the two hit it off. Pederson chose to promote Groh instead of hiring a more-experienced outside candidate or a more-tenured member of the staff. "He saw firsthand how Frank and I interacted and things we did," Pederson said. "I'm encouraged by where he's at and what he's doing. He's doing an outstanding job right now. The key is he and I having that open dialogue and open communication, much like Frank and I had.That's something, if he has questions or I have questions, we've bounced a lot of stuff off each other and asked a lot of questions. That's what you've got to have in order for this to work." Eagles’ offensive coordinator Mike Groh talks to reporters before the Eagles hold OTAs at the NovaCare Complex on Tuesday. Groh, 46, was most recently an offensive coordinator from 2006 to 2008 at the University of Virginia, where he once played quarterback and where he coached under his father, Al Groh. Since then, Groh coached at Alabama and Louisville in college, and the Chicago Bears, Los Angeles Rams, and Eagles in the NFL. He brings a diversity of experience that he did not have when he was in his mid-30s and had not worked anywhere else. "I've grown significantly," Groh said, reflecting on his previous stint as offensive coordinator. "I'd like to think I'm a lot better coach now than I was 10 years ago. Just like anybody who has done something for 10 years, you hope you've learned a lot from your experiences and taken bits and pieces from the bright people that you've been around." Eagles defensive end Chris Long, who played at Virginia while Groh coached there, has seen the before-and-after. Long pointed out that Groh's multiple stops built "savvy" and "experience" that he's brought to the Eagles. "He was always a really good coach that could relate to players, but the more groups and the more … players he has coached through his journey – different places, different systems – he's armed with all that," Long said. "He's coached great players like Alshon [Jeffery], Brandon Marshall in Chicago. Managing those players, it's not easy for a new coach to come into the NFL and [work] with a bunch of Pro Bowlers like that." Groh's NFL experience has been with wide receivers, but he's still a former quarterback. When Pederson promoted Groh, one of the selling points was that Groh played quarterback and views the game through that lens. At practice on Tuesday, Groh could be seen working with multiple positions, including receivers. The time with the quarterbacks is a welcome change for someone whose arm might be sore at the end of practice. "I see the game as a quarterback," Groh said. "I know that, by trade, I've been coaching the wide receivers here in the NFL the last six years. So that's, I guess, where my expertise would be at this level. But I've always seen the game through the eyes of the quarterback. Now that I have the opportunity to move around a little bit, I look forward to being involved and engaged with the quarterbacks more." Still, his influence last season was most apparent with the way the Eagles' receivers improved – especially Nelson Agholor. And they won't let him forget it, giving Groh a hard time when the team breaks for position meetings and Groh doesn't follow them to their room. The rest of the offense will now see what the receivers benefited from last season. And Groh can put his stamp on a role that led Reich to a head-coaching job. "He's always had a passion for the game," Agholor said. "He's a former quarterback, so he will teach us where the ball is supposed to go on time, in progressions, and he'll also teach us to run routes in the rhythm of progression. …Frank's a special guy, He did what he did, and I think Groh's a special guy. He has his own way of doing it."